The first huntsman to be convicted of breaching the Hunting Act has had his conviction overturned. Tony Wright of the Exmoor Foxhounds was found guilty of hunting a wild animal with dogs after a prosecution by the League Against Cruel Sports in 2006. An Exeter Crown Court judge allowed his appeal and said he was satisfied that Mr Wright had thought he acted to ensure he complied with the law. The Countryside Alliance said it was a "nail in the coffin" of the Act. Mr Wright, a huntsman with the Exmoor Foxhounds since 1982, denied the charge. After the hearing, Mr Wright said: "I am delighted with the result, which is what I believed all along." He said it was a "very difficult law to interpret" and was "probably not very well written for people like myself to understand". "It shows we were trying our best and that is all anyone can do," said Mr Wright, adding that the Act was not "black and white". The chief executive of the Countryside Alliance, Simon Hart, said: "This verdict is an absolute vindication of Tony Wright and the Exmoor Foxhounds and another nail in the coffin of the Hunting Act." "The Hunting Act is not only a pointless and prejudiced piece of legislation, it is also a very bad law. "If the courts cannot be sure what is hunting and what is not, how on earth can anyone else?" Mike Hobday, the head of the prosecution unit of the League Against Cruel Sports, which brought the private prosecution, said it was a "deeply surprising decision". "We shall be taking urgent legal advice about the prospects of appealing on some of the findings of law." He said he was "shocked and disappointed" at the legal interpretation of the Hunting Act. 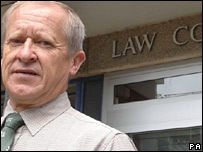 The court heard from Richard Furlong for the Crown Prosecution Service that on 29 April 2005 Wright hunted two foxes with two hounds on Exmoor in circumstances which were in "clear breach" of the Act. Wright told Exeter Crown Court that he had read the Act, which came into force on 18 February 2005. He said Exmoor farmers had asked the hunt to "come and kill these bloody foxes" after experiencing losses during the lambing season. He told the court: "We wanted to ensure we worked within the Act." At Exeter Crown Court judge Graham Cottle allowed his appeal saying he was satisfied that Mr Wright had proved that he reasonably believed, perhaps optimistically, that he had put in place safeguards that he thought would ensure compliance with the Act.